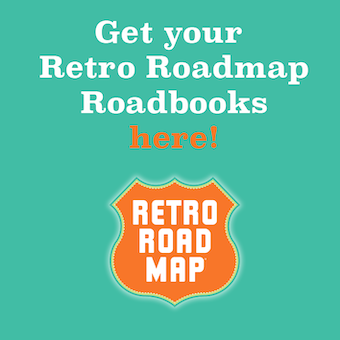 A Retro Roadmap Palm Springs Report from Greg Tormo! 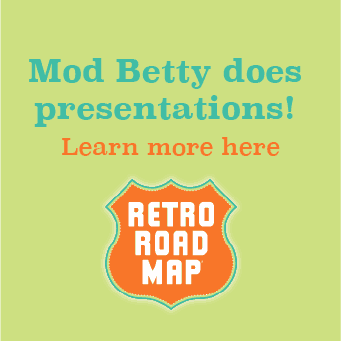 Mod Betty was contacted by a talented artist pal who is heading to Palm Springs and wanted to know what to look for for visual inspiration. Since I can't be out there right now myself (INSERT HEAVY SIGH HERE) I contacted my pal in PS, Greg Tormo, who was more than happy to show the both of us the visual delights that await in that swell city. Enjoy! 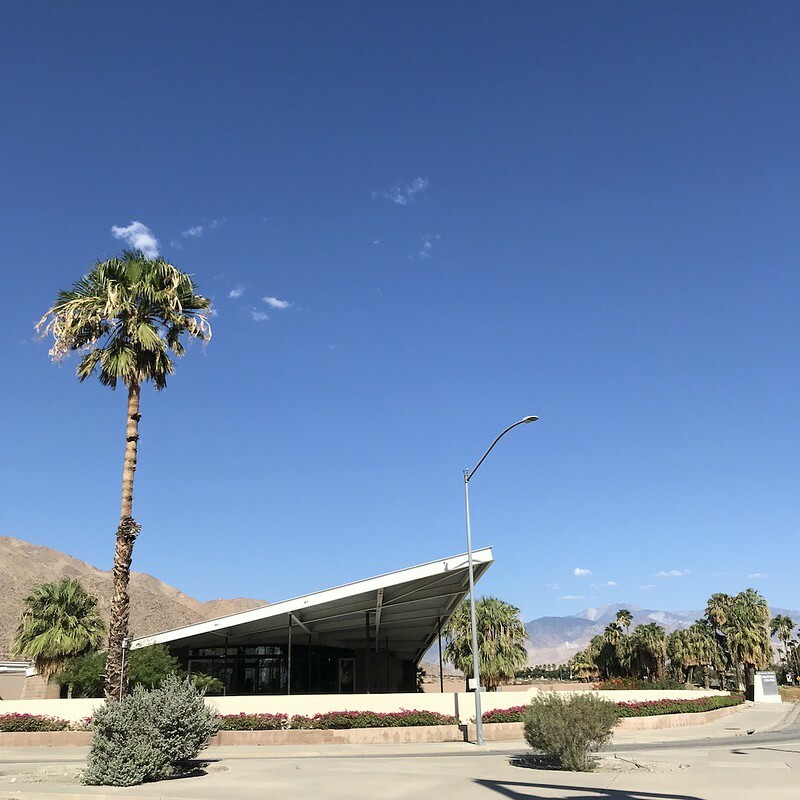 Palm Springs is known the world over for its sunshine, its desert landscape, its iconic mid-century modernist architecture, and its leisurely lifestyle. It’s a feast for the eyes! 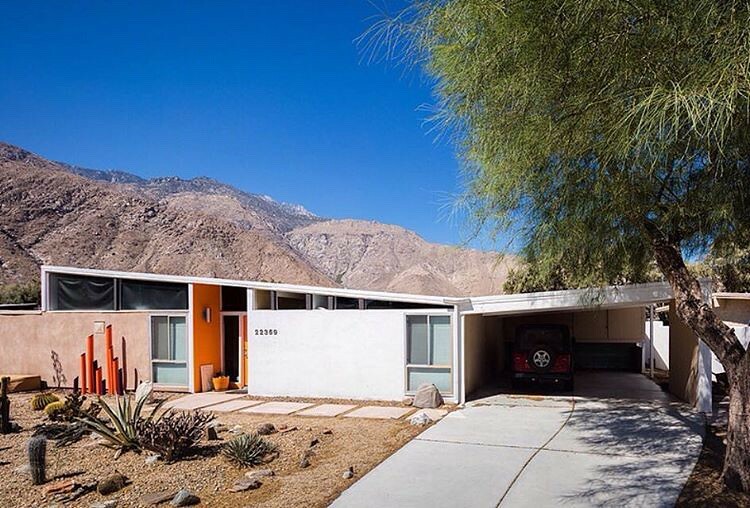 And the shapes, colors and textures of Palm Springs are treasured and promoted by its residents. We love to share our appreciation of all things mid-century with other mod-loving architecture aficionados, and I am no exception. The sheer volume of groovy visual treats is astounding. 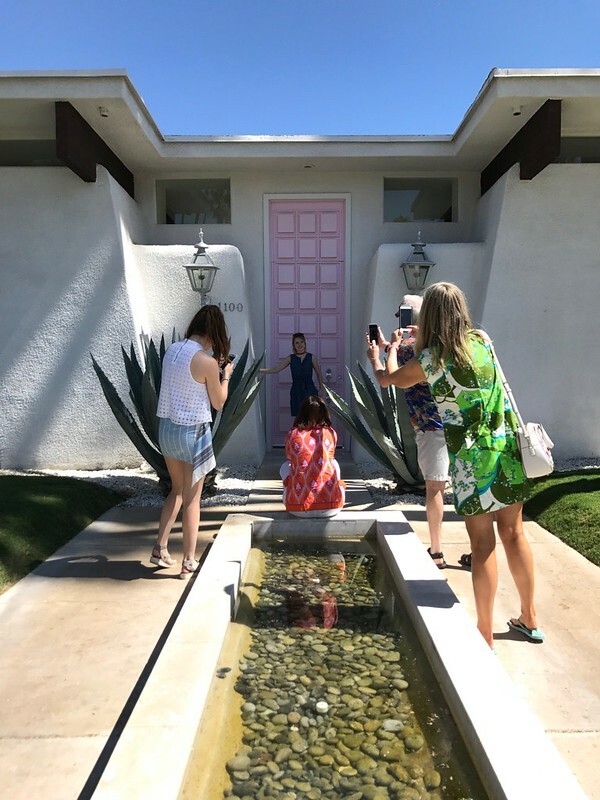 When I first visited Palm Springs, I felt I was drinking from a firehose of fantastic fun and I didn’t really know where to point my camera to capture the essence of what I was experiencing. But after the deluge of delights, it’s fun to focus on the details, as it’s the aggregation of the minutiae that really makes the architecture special. 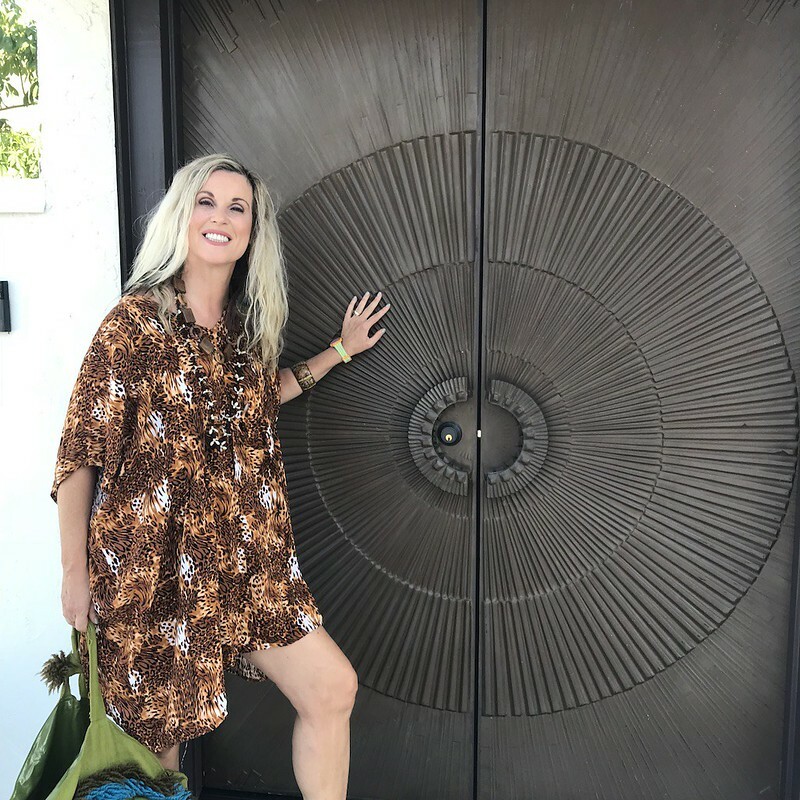 This is strictly about exterior features and publicly accessible places, because most casual visitors don’t get a chance to peek into the private homes. But I will share some mid-mod interior décor eye candy in a future feature. There are dozens of different breeze block designs to be found all over town. Ron & Barbara Marshall have written the definitive book on the subject, Concrete Screen Block: The Power of Pattern. I’ll write a future post in greater detail, but check out The Parker for a beautiful, large-scale example. The Jonathan Adler interiors are pretty great, too! 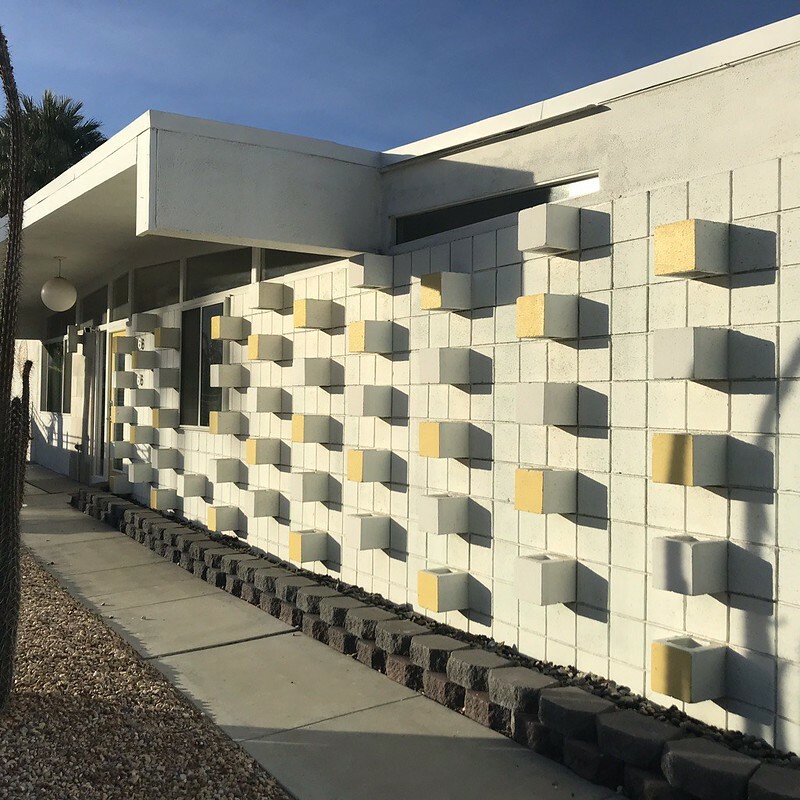 But as you wind your way through neighborhoods like Twin Palms and Sunmor, you will see many smaller scale installations that complement their accompanying homes. Lesser known cousins to Breeze block are these masonry features of many homes, jutting out several inches so as to cast interesting shadows on otherwise featureless facades.  Good examples are in Racquet Club Estates and El Rancho Vista Estates. 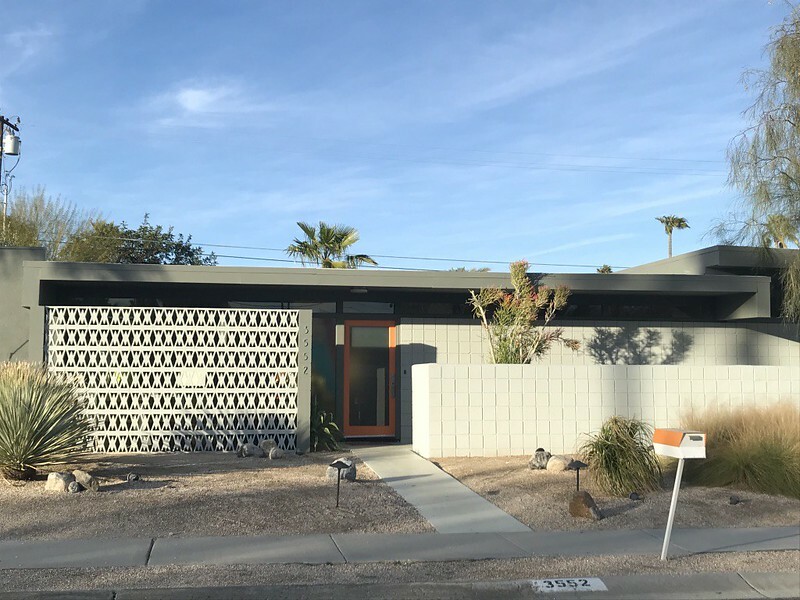 One of the ways that William Krisel made the Alexander tract homes visually interesting to potential buyers was to offer different roof shapes to his otherwise identical floor plans. From the street, the homes looked different from each other while allowing the builder to economize on costs by keeping interiors uniform. The roof line that gets the most attention and is rather abundant in town is the so-called “butterfly roof” and the larger the home, the longer the butterfly’s “wingspan”. There are small examples in the San Jacinto Cove neighborhood and giant examples in the Twin Palms neighborhood. But there are other interesting roof styles to look out for, too, including folded plate, gabled, Polynesian-inspired A-frame and parabolic. They are bold and speak to the space-age, optimistic sensibility of their day. Many cities around the country celebrate the diversity of their homes’ front doors, but if I see another fire-engine red colonial it will be too soon. 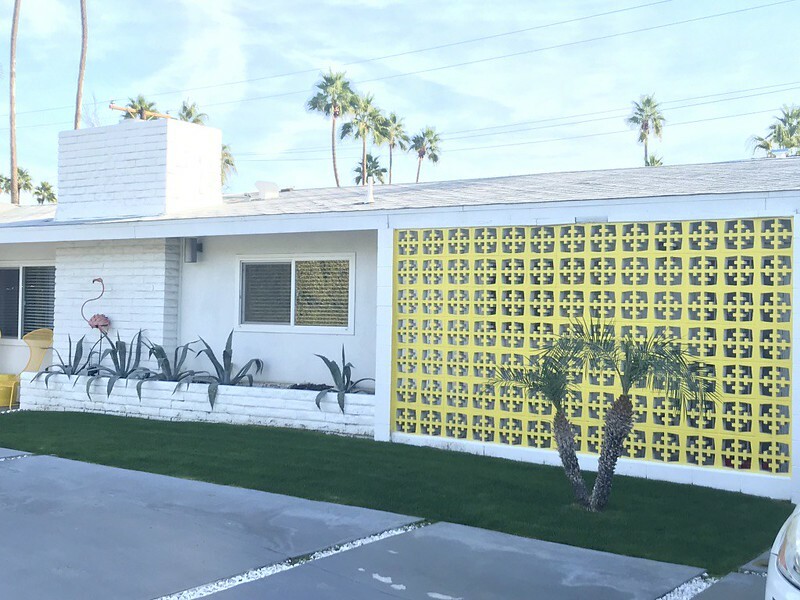 Palm Springs doors are a little different – pink or yellow and other bold palates. In mid-mod or Hollywood regency style, with geometric highlights. We’ve even got a few brutalist bronze Forms+Surfaces sunburst doors around town. Some door are icons themselves, in spite of their owners’ desires to retreat from the spotlight (I’m talking about you, “That Pink Door”). 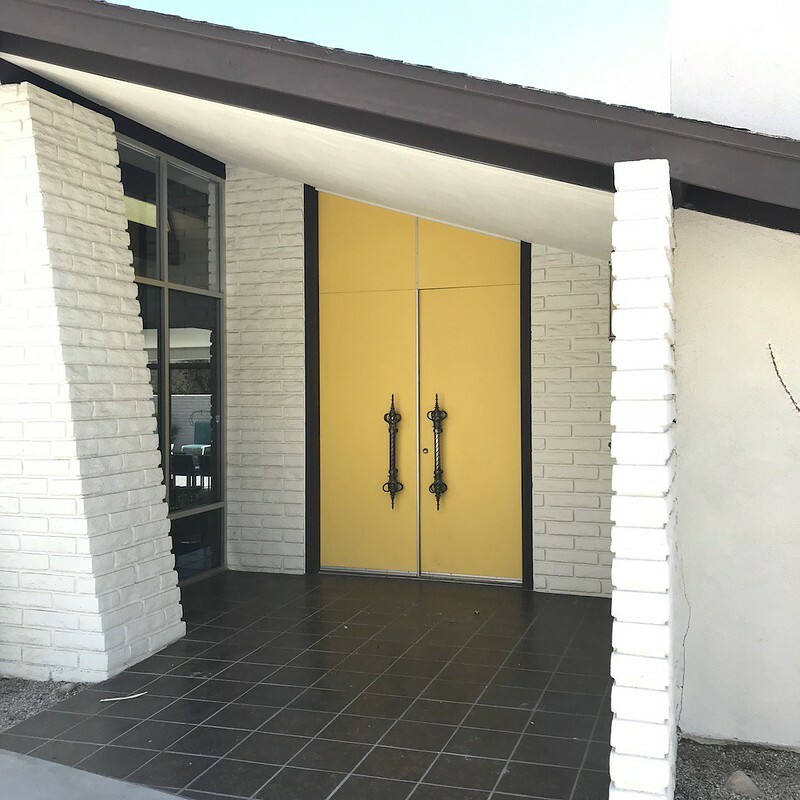 Great doors are to be seen in the Kings Point area of Indian Canyons, Vista Las Palmas and Deepwell. 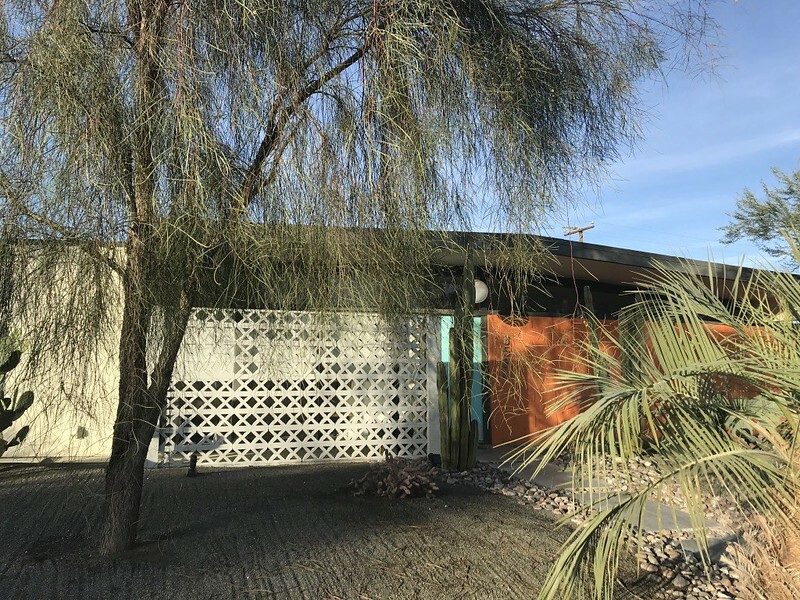 Although many people have installed garage doors for privacy and security over the years, the original designs of the mid century modern Alexander tract homes feature open air, covered carports, not enclosed garages. After all, these were weekend homes for many, and there really was no need for much garage storage or to protect their autos from the elements for the short periods of time people were here. Owners drove into town in their cars from LA and other cities within a few hours drive and left the carports empty when the drove home. 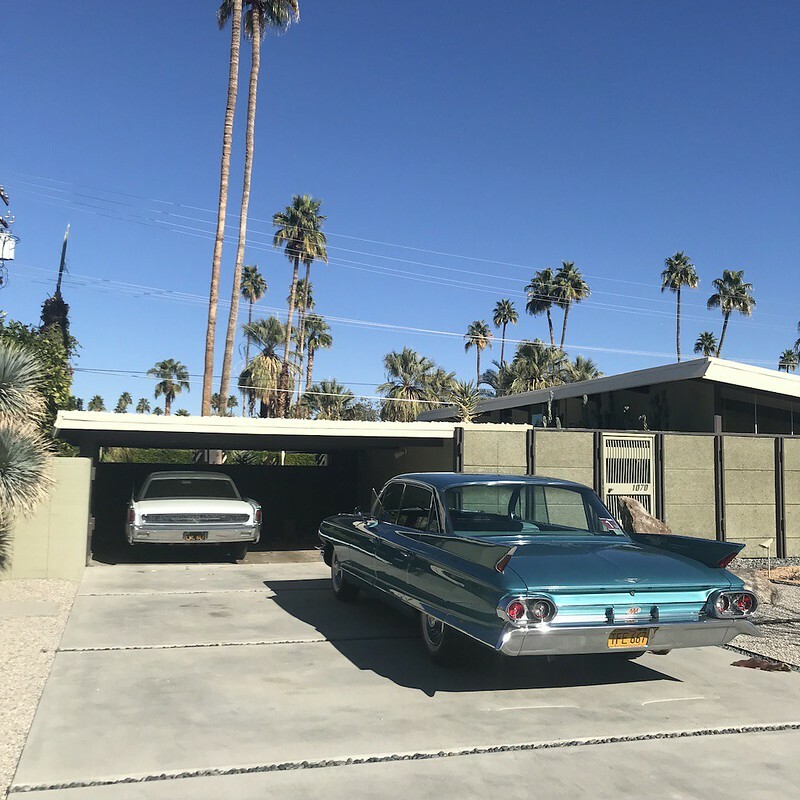 Even if you were here seasonally, you might not need a full garage if you brought your car with you to the temperate winter climate of Palm Springs. 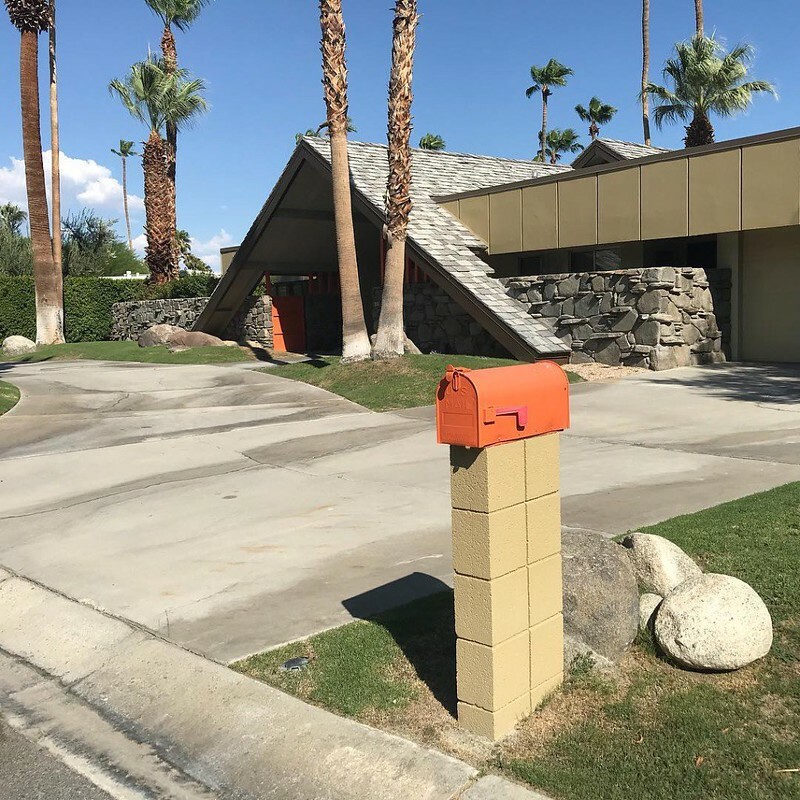 Palm Spring was (and still is) a playground for powerful people passionate about their pastimes. And some collectors swap out their favorite cars once in awhile, so you can see quite a variety of vehicles in the same carport depending on when you drive by. 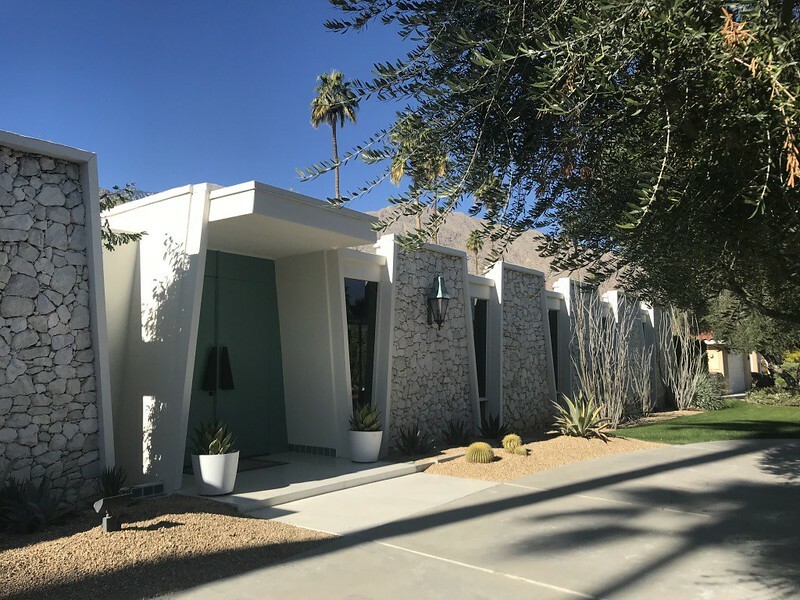 Often paired with broad-brushed stucco or other bold architectural feature, there are entire communities in Palm Springs with homes sporting prominent stone facades. Occasionally they’ve been painted to match the home, but there are still many in their natural state. 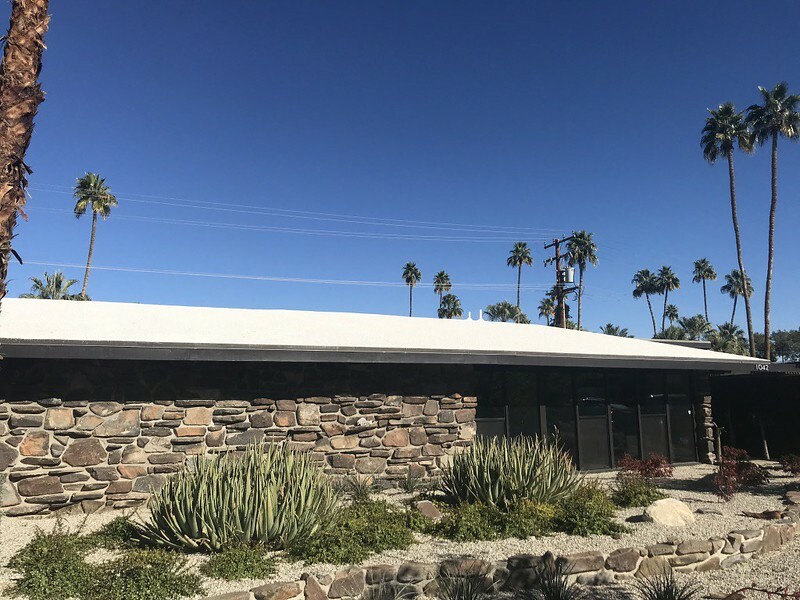 Great 1950’s & 60’s era stone facades may be found in Vista Las Palmas and chunkier, early 1970s era facades may be found along Toledo Drive in Indian Canyons. Feel free to contact me before you visit Palm Springs.! and discover the beauty of the desert paradise.